I’ve been so amazed by the participation in the COAH Community. You all have amazing questions, and I love reading through all of the responses as well. They’re so great in fact, that I’ve decided to start highlighting some of them as blog posts so they don’t get overlooked! One of the lovely ladies in our COAH Community forum posted our topic for today, and it was just too good not to share! Not only did I think it would make a great blog post, but I also wanted to share my top 10 things with you all as well. 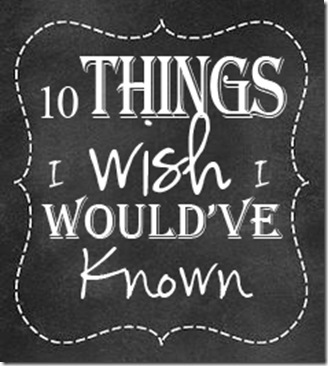 So here are my top 10 things that I wish I would’ve known before we started homeschooling. Of course some of these things pearls of wisdom were given to me when we started, I was just too eager and set in my vision to hear them out. So here I am today, passing them on to you. I hope you’ll find them helpful and that they will encourage you in your journey. Let’s do this in a Late Night style count down, shall we? Number 10. Several stores give teacher’s discounts to homeschoolers! Just ask to see if your favorite store offers one! Some that I know of are Barnes & Noble, JoAnns, and Michael’s craft stores. Also companies like Adobe give discounts on software such as Photoshop and PS Elements! YAY! Number 9. Get connected. Check online, local schools, or at your local churches to see if they offer a homeschooling co-ops and support groups. Start up a monthly LEGO club, or science club. There are so many fun things you can do to meet other homeschooling families. Connecting with others can go a long way in staying encouraged in your homeschooling journey! Check out how others get connected in the COAH Community. Number 8. The best curriculum is the one you’ll use! With so many different curriculum choices out there (including free options), it can be overwhelming to choose the best one. Honestly, I’ve used a mix of freebies with more expensive curriculum and I’ve found that our kids have learned no matter what brand I’ve used. I think back to a particular curriculum that several of my friends started using. Every time I looked at it, I felt overwhelmed. The idea of planning it all was just too much. And even though it looked great and I’m sure their kids loved it, I knew that I wouldn’t be able to keep up with it, so we went a different route. I’ve never regretted that decision, we’ve done great with what I picked, and it fits our needs well. So my advice to you…don’t get dragged into every new thing that comes along, thinking that it will be better than what you have. Choose curriculum based on the needs of your family. Number 7. There is not one perfect curriculum out there. When I first started homeschooling, I was searching for an all-inclusive very best homeschool curriculum out there. I like consistency, and for me that meant I wanted to use all one brand of curriculum. After our first year using an out-of-the box curriculum, I discovered that I liked some subjects they offered but not all of them. It was at that point that I started trying different vendors for different subjects. Now we use several different curriculum in our homeschool, and we’re very happy with them! I guess that means I’m officially eclectic! Find what works best for your family for each subject, and don’t waste your valuable time searching for that illusive perfect curriculum. Number 6. Less is more. Honestly, as a blogger, we receive a lot of products for review. And while we’re very thankful to have that opportunity, my homeschool room started becoming a little overwhelming. While there are tons of great products available to homeschoolers now, kids don’t need to have “things” in order to learn. It’s always great to have a lot of books around, and we like to frequent our library. And I definitely recommend a few manipulatives, and basic school supplies. But you don’t need to have a lot of stuff to encourage learning. Libraries, nature walks, and field trips are a great way to incorporate learning into your homeschool without accumulating clutter. Sometimes less is more in the area of homeschooling! Number 5. Take lots of field trips and do hands-on activities. As homeschoolers, we have a little more freedom to include hands-on activities into our days. We can include educational trips, activities, recipes, crafts, and nature walks into our schedules. From what I’ve observed, our children learn from and remember these times so much better than those boring old worksheets! Number 4. Create a schedule. One advantage we have as homeschoolers, is that we’re free to plan our own schedules. We can pack them as tightly as we like, or give ourselves some breathing room. We can follow a pre-planned curriculum schedule, or alter it to fit our own needs. When we first started, I didn’t really outline a routine, we just flew by the seat of our pants. Thankfully it was preschool, so there was no real harm done. The following year, I took the time to outline a schedule for our school days. This really helped to keep us on track, and get things done, including house work. My days were much less chaotic, and more enjoyable for all. However you schedule your day, I do suggest you at least create a basic routine that works for your family. If you veer off course, no worries. At least you have a baseline to keep you on track. Number 3. Create your own homeschool. When we were considering homeschooling, I had a vision of school desks, happily working students, and an apple on my desk. I quickly discovered that homeschooling doesn’t mean bringing the traditional classroom into your home. Unless that’s what you want. It can mean many things to many people. What your homeschool looks like, won’t necessarily match your friends. You might have a school room, you might do school in the kitchen. your kids might prefer to work in their rooms where it’s quiet. They might like to wrap up in a blanket on the couch where they’re comfy. Really the best homeschool environment is the one that works for your family, your home, and you! Number 2. Be flexible. Seriously. Be flexible. Remember that schedule we just talked about? Make sure you run it, and that it doesn’t run you. You might have a curriculum that just doesn’t fit your family, you might have a bad day, you might get sick, etc. Whatever it is, make sure to remember that being flexible is key to remaining sane. Did you give that curriculum a good shot, but it’s just not working? Sell it on eBay and find another one that fits your needs better. Having a horrible day? Get basics done, and then head out for an impromptu field trip, or park visit to break up the monotony. Everyone sick? Cancel school for the day, and tend to your family. You can always pick it back up tomorrow. Number 1. Don’t worry about what other people think! One of our biggest challenges when starting was our fear of what our family and friends would say. After 9 years of homeschooling, I’ve learned that the only opinion that really matters is God’s. Are you obeying His calling to homeschool? If so, then you’re doing the best you can for your family. Our kids are kind, well-rounded, and social, and we’ve been so blessed since we have followed His will for our family. Need encouragement? Check out my candid conversation with God regarding homeschool. Want to hear what other people are saying? Check out my I wish I would’ve known forum topic to see what others have to say. 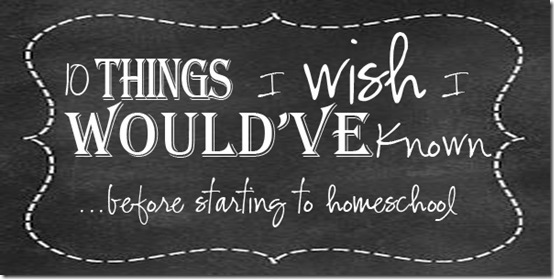 Feel free to head over and share some of your things you wish you would’ve known before you started homeschooling too! Have a post you think would be great to share that I may have missed? Send me an email, or tag me in the forum so I can take a look. All great ideas to remember. I am not a homeschool parent, but these ideas are important for all parents who teach their children. I always add to the curriculum from school, #8 is important to remember. It’s easy to get distracted and jump from curriculum or book without finishing. I would also like to start more weekend fieldtrips – such as visit one park, museum, or event each month to enhance school learning. I love Erica, I love how her kids are kind. I mean thumbs up Erica to you and your husband. Keep looking to God for answers. I was coming home from work one day she was talking about homeschooling. I had her check our you channel. Good tachers rock. Thank you for this, I need it today! I’m homeschooling my kindergartner and attempting to do pre-k with my 4 year-old while keeping my two year-old busy. Needless to say, my days hardly ever go as planned and it can be so discouraging. Thank you for reminding me about flexibility. Hopefully I won’t always fly by the seat of my pants, but with my kids so young it feels like that’s all I do! Thanks again for this post. Hello. I have been homeschooling for the first time this year and am still torn about continuing. However, I think I am going to continue. I have several questions but I was wondering if you could share how long your school day is? At first I was having such a hard time squeezing everything in. I work part time from 6 a.m to 10:30 a.m. and I would rush home, kiss the kids (ages, 3,5,7,9), say bye to the nanny, and squeeze circle time in before cooking lunch. After lunch, I would put my youngest down for a nap (which is always a struggle) and start school again from 1 to 4. At 4 we normally are running to the gym, dance class, church, or something else. Anyhow, I always felt overwhelmed and rushed. That is the biggest reason I was reconsidering doing homeschool again. Then, the Lord let me meet a lady last weekend who told me about your website and also about the idea of workboxes. I tried it immediately (literally the next day). The kids started doing their independent work while I was at work! I didn’t even ask them to! Anyway, so now I only spend about 2 hours on school a day because they finish a lot of their work when I am at work. How strange for me to go from having no time, to now having time to throw in a load of laundry! Now, I am worried that I am not doing enough. Can you please share how long it takes you? I don’t want to shortchange my kids. I also don’t want to be as overwhelmed as I was. Thank you for your time. Yes, yes, and yes again! This list is spot on… and includes many of my fears my first year homeschooling. I spent so much time thinking I was failing because I wasn’t being flexible, because I expected the curriculum to work magically, and because I really was trying to do school at home rather than homeschool. It was a long few months, and at one point I actually called it quits! Thankfully, it was over a summer break and I took some much needed time to research and revitalize our homeschool. At the time I never thought to look for posts like this one… I only read beautiful success stories that made it look so easy. After taking a break and coming back with more information and more courage we did a little better, but more importantly, we learned more about why we were homeschooling and what we wanted to get from our homeschool. Today we still have some struggles, but I think that’s just par for the course. The difference, of course, is I now know how to look at those struggles and evaluate them for what they really are – opportunities to improve! That’s great! Thank you for sharing this informative blog. Can anyone help me with Grade 7 curriculum? I wish I had known that most public and private schools DO NOT accept homeschool high school credits. Hi Christine, I think it depends on where you are. Most of our state schools accept homeschool credits if you’re transferring into them. All kids push back a bit when starting out, they like to see what they can get away with especially from mom 🙂 But just be consistent with what is required of him and he’ll start to listen. It just takes time. I also make it clear that they’re in charge of their school, so they can either do the work I set out for each day then have free time, or they can procrastinate all day and miss their free time. We also have school with dad for kids who procrastinate too much. That’s more of a consequence and they don’t like to have to do that. But since he’s young, I’d just say be consistent and try to make it fun. But expect some push back, just stick with it!